The Michelin star restaurant Kong Hans Kælder may be in the oldest room in Copenhagen, but Executive Chef Thomas Rode Andersen's inspired cuisine is definitely in the moment. Kong Hans Kælder is a gorgeous restaurant that opened in 1976, and is located in the cellar of the oldest building in Copenhagen dating to the 12th century. 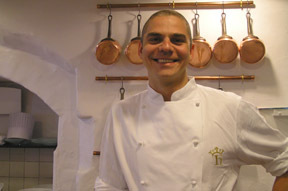 Executive Chef/Director Thomas Rode Andersen joined the restaurant in 1997, and creates inspired French-Danish cuisine. 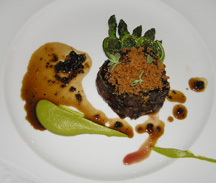 The restaurant has two menus to select from, Innovation and Signature, which change according to the seasons. 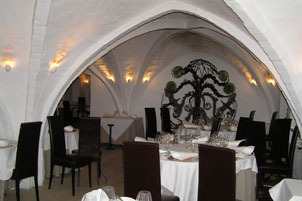 The elegant white dining room has gothic arches, wide plank wood floors, and features an interesting sculpture by a Danish artist in the back of the restaurant that has many pillar candles that cast shadowy light on the walls. Small sconces along the arches provide additional soft light, and niches in the walls hold flower arrangements and woven baskets of bread. The tables are adorned with white damask linen tablecloths draped over mushroom linens, crisp white napkins, gold charger plates, tulip shaped brass candlesticks aged to a rich patina with short creamy pillar candles, and silver salt and pepper grinders. Edward F. Nesta and I had dinner at the restaurant in May 2006, where Sommelier/Sous Chef Thilde Maarbjerg began our evening with an aperitif of Clos des Goisses, Philipponat, made with 50% pinot noir for power and 50% chardonnay for elegance, and brought us a selection of teasers, an ostrich shell opened to reveal homemade blue potato crisps, a small bowl held cêpes mayonnaise and delicate cêpes biscuits that were wrapped in cellophane bags, followed by an amuse bouche of smoked cheese with cucumber and roe. Our tasting menu began with Oysters from Marenne Oléron with cowberries, smoked oil and caramelized lemon (Østers fra Marenne Oléron Med tyttebaer, røolie, & karamelliseret citron). 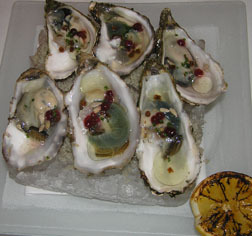 Six oysters sat regally on a large chunk of sea salt, with a sprinkling of cowberries on the oysters to add interesting taste and texture, warm smoked oil gently warmed the oysters and with a squeeze of the caramelized lemon were absolute perfection. Our Sommelier paired the oysters with Egly-Ouriet Brut Rosé Grand Cru, Ambonnay from Champagne, France. To accompany the oysters, our waiter brought us a silver basket of rich dark bread made with malt and cocoa, and warm crispy rolls served with a bowl of butter and a bowl of duck fat topped with pumpkin seeds. Although we tried to resist the breads, we had to succumb to sampling both the rolls and the bread, which Edward loved with the duck fat and pumpkin seeds. 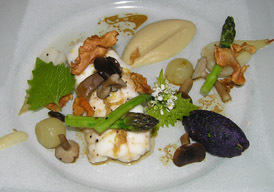 We continued with Monkfish with Pata Negra Fat, Jerusalem artichokes, pickled mushrooms and apples, a quenelle of mashed blue potatoes, green asparagus, pearl onions, and Jerusalem artichoke cream, which our Sommelier paired with an Estate Alexander Valley, Chardonnay, 2002, Stuhlmuller Vineyard, 14.1 % alcohol, that was like a Mersault, with a green apple and pear nose, rich with mineral notes and full-bodied en bouche. The monkfish was gorgeously presented with a decadent portion of shaved and fried Jerusalem artichokes, a scattering of tiny pickled mushrooms that were divine, and Jerusalem artichoke cream that I have decided that is my new favorite. Our table overlooked the open kitchen where we could see Chef Thomas and his team working smoothly to create a great experience for each of the guests. Judging by the upscale clientele at the restaurant, Kong Hans Kælder, is definitely "the" place to have dinner. Tasting continued with Danish glazed beef crowned with crispy brown bread crumbs and tiny thyme leaves, served with a marrow sauce, fiddlehead ferns, asparagus tips and a dollop of herb cream, paired with a Castello di Fonterutoli Siepi 2001, from Tuscany, and made of Sangiovese and Merlot grapes, with 14% alcohol. This delicious super-Tuscan had a big nose of spice, tobacco and dry earth, with blackberries and cassis en bouche. 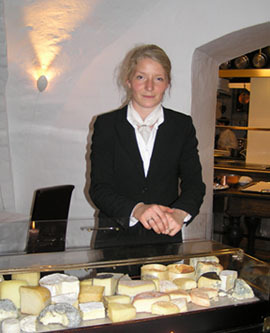 King Hans Kælder features 30-40 cheeses on their cheese trolley for the Selection of Mature European Cheeses (Udvalg af Monde Europæiske Oste Fra vores vogn). We sampled cheeses from the Danish island of Funen from Steensgaard where we had stayed at the manor house that makes the cheese, a Veneelbo from Jutland that is washed in mead (like Burgundy and Alsace style), a Saint Clemens from Bornholm island, and Thilde's favorite, Epoisses from Burgundy, a powerfully rich, slightly salty and creamy cheese. The cheeses were accompanied with quince preserves and served on Royal Copenhagen Blue Mussel Fluted porcelain. 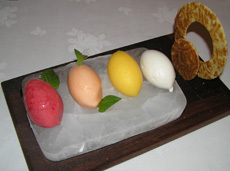 We ended our tasting menu with a selection of Sherbets with tuilles (Sortiment Af Sorbeter), which were coconut, mandarin, blood orange and cherry sherbets beautifully presented on a plank of rectangular ice on a wooden board, accompanied with what the Danish refer to as "good advice" cookies made with an iron in the shape of circles. The sherbets were fresh and full of fruity flavor and the crispy cookies complemented them with their lovely crisp texture. Read our Chefs' Recipes section for an interview with Executive Chef Thomas Rode Andersen and his tempting recipe for Marinated Young Squab in a Frothy Bouillon of Danish Ginseng with Braised Leeks.